In this Kel'Thuzad Build Guide, we provide an overview of his strengths, abilities, talents and matchups. Kel'Thuzad is a powerful ranged Assassin that falls somewhere between Chromie, Kael'thas and Jaina. He has the delayed attacks of Chromie (which require near perfect aim), the AOE power of Kael'thas, and the crowd control/utility of Jaina. It's an exceptionally strong mix, but he remains a Hero that's hard to play and even harder to master. Unlike Chromie, Kel'Thuad has a range similar to that of Kael'thas or Jaina and considering he has no "outs", or immediate crowd control, his reliance on positioning is greater than all his peers. Kel'Thuad makes up for this in not only his burst potential, but also his AOE pressure. His collection of abilities offer powerful zoning potential, plenty of crowd control, and ridiculously high damage. What's particularly interesting about Kel'Thuzad is that all his abilities have a delay, or require further interaction from him. Whether it's the brief cast delay before unleashing Death and Decay, or the momentary pause before Frost Nova erupts, all his abilities require precision and timing. Missing an ability with Kel'Thuzad can be fairly punishing as his cooldowns aren't short (he's no Gul'dan) and he relies on landing his abilities to maximize his Quest Trait. Kel'Thuzad's Trait allows him to boost his Spell Power by 75%, but this requires him to successfully land his abilities against players. In total, he needs to hit 30 in order to lower his base cooldowns, and to increase his damage. While it might sound simple (especially considering he is AOE heavy), a lack of aim or the ability to predict where players will move, can see him take long periods of time to maximize it. A Kel'Thuzad without a fully capped Trait is much weaker, and will severely limit his team fight potential. In the right hands however, and especially on Battlegrounds which revolve around static Objectives, Kel'Thuzad can excel and his damage has the potential to exceed everyone around him. Master of the Cold Dark - Kel'Thuzad's Trait allows him to boost his damage every time he lands Frost Nova or Chains of Kel'Thuzad against an enemy Hero. Each Hero hit contributes one stack, with 30 completing the Quest chain. It's imperative that you aim to complete your Quest Trait as quickly as possible, as Kel'Thuzad not only needs Glacial Spike at 15 Blight, but he also needs the huge Spell Power boost at 30. If you join in on every team fight, it takes around 8 minutes to complete all stages of his Trait, but I have completed it in less against enemy team's that insist on fighting at every opportunity. Ideally and to complete it quickly, you should be aiming to combo Glacial Spike > Chains of Kel'Thuzad > Frost Nova for rapid completion. Finally, it's important to note that the small progress bar next to your portrait (lower left of your screen) displays your Trait and Blight progress. Death and Decay (Q) - As Kel'Thuzad's primary form of poke, Death and Decay can take some practice to get the most out of. What's important to remember is that you have to land this ability against an enemy. If it fails to make contact with a minion, mercenary or enemy Hero, the spell will fail and go on cooldown. If you do hit a player, they and all those near to them will suffer immediate damage. Immediately after this, Death and Decay will then deal rapid AOE damage in a small pool on the floor. Most players tend to avoid the damage over time that's left behind, however, it acts as a solid zoning tool and anyone who is stupid enough to sit in it will suffer fairly high damage. By the time you complete your Trait, Death and Decay deals over 400 damage and with such a small cooldown, it's undeniably strong. Frost Nova (W) - Providing Kel'Thuzad with AOE damage and crowd control, Frost Nova takes a lot of practice to get particularly good with. As a small AOE telegraph, Frost Nova will detonate, deal damage and root anyone in the center. Those on the outside (similar to a smaller version of Jaina's Ring of Frost) will be slowed. Hitting enemy Heroes with the inner or outer ring will contribute to your Blight meter, but ideally you want to be ensuring you land the root. While slowing Heroes is undeniably good, rooting players allows you to follow up with your Heroic, have your team collapse on them or to simply permit you to throw a few basic attacks their way. Due to the cooldown of Frost Nova, try not to waste it: a miss is costly in terms of lost damage potential. Chains of Kel'Thuzad (E) - Undoubtedly one of the most flexible, but complex abilities in the game, Chains of Kel'Thuzad is a two-stage ability. Simply firing it towards a player will deal small, but immediate damage. However, for 4 seconds after the initial impact you can then cast Chains of Kel'Thuzzad again to drag that player towards enemy scenary, or another enemy Hero. Chains of Kel'Thuzad can only interract with opposing scenary (walls), structures (Keeps) or Heroes, so it's important not to blindly use it when 1 on 1. Ideally you want to cast Chains of Kel'Thuzad against two Heroes to trigger its stun, or to pull an enemy Hero into scenary so that you can quickly cast Frost Nova where they land. The stun from Chains of Kel'Thuzad is brief, so landing your follow-up abilities can be tricky. However, with enough practice it's possible to land Frost Nova > Shadow Fissure for instant eye-watering burst. Frost Blast (R) - Acting similarly to Kael'thas' Pyroblast, Frost Blast fires a single target projectile straight forwards. It will track the target and deal damage to them, before causing greater damage in a radius around the impact site. Where Pyroblast deals massive damage to the primary target, the threat of Frost Blast is to those around the victim. In a way, it's like a moving Crystal Aegis (see Auriel) that offers zoning potential while forcing the targetted player to stay and cause wide AOE damage to their team, or to leave the fight (and result in their team being down a man). Considering the explosion causing a root, Frost Blast can be fantastic when used at close range to ensure escape isn't an option. However, it has a very long cooldown and against Shadow Fissure, I suspect it'll be rarely picked. Shadow Fissure (R) - My heroic of choice for Kel'Thuzad simply because of the fact it deals AOE damage, is global and has a tiny cooldown, Shadow Fissure will undoubtedly be tweaked. With such a low cooldown and mana cost, you can effectively spam your Heroic across the entire Battleground, or during any team fight. While it does have a brief delay before it erupts and causes damage, it once again offers zoning potential even if players move out the way. With enough practice and during fights over an Objective, Shadow Fissure proves easy to land and with a well timed Frost Nova, you can ensure its damage. Barbed Chains reduces the armor of anyone caught by your chains by 10. In addition, it also increases its damage by 125%. For those wombo-combos of dragging players together, or against your Glacial Spike, it allows you to deal far more burst. 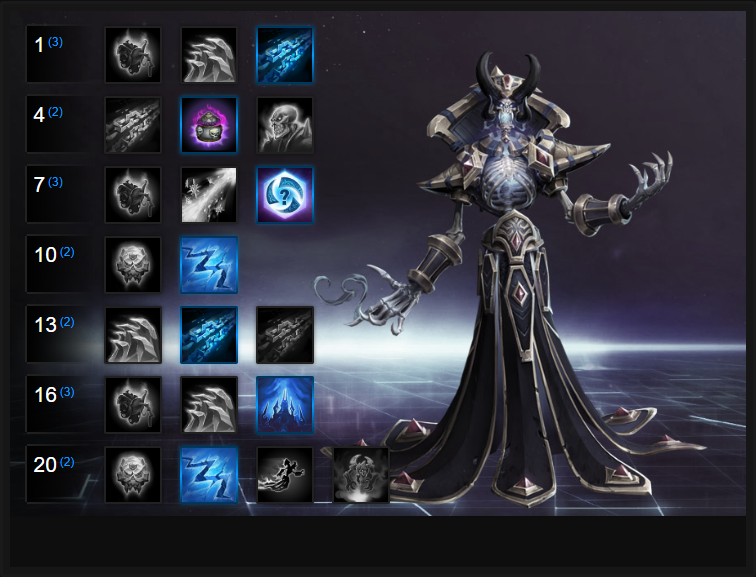 Phylactery of Kel'Thuzad acts similarly to Malthael's level 20 Talent, No One Can Stop Death. Allowing Kel'Thuzad to revive himself once he has collected 12 Regeneration Globes, it's an extra life that's incredibly easy to maintain. Rotating lanes and being on time for camps ensures he always has Phylactery of Kel'Thuzad ready in case he dies. Best of all, once it's available Kel'Thuzad can heal himself for 10% of all spell damage dealt to enemies. In a team fight or when clearing camps, it offers fantastic sustain (especially when landing your AOE attacks). Ice Cold builds into Glacial Spike (part of your Trait once you've unlocked it), allowing it to deal 300% extra damage when it detonates (ouch!) while also lowering its cooldown by 5 seconds. Considering Glacial Spike is key to your burst combos, Ice Cold is a must. Variable: If you're after a simpler playstyle, Chilling Touch is a good alternative. It empowered Kel'Thuzad's basic attacks so that every 8 seconds they deal Spell Damage instead of Physical, while also slowing those struck by 30% for 2 seconds. Best of all, it also makes Kel'Thuzad's basic attack when empowered AOE, allowing him to wipe a minion wave or deal serious damage to a team. What I love so much about this Talent is the fact it allows for outrageous damage once he has completed his Trait, but it also offers eye-watering spike potential. If Chilling Touch is active, landing Frost Nova > Shadow Fissure > Chilling Touch (Basic attack) can deal 3500 damage instantly at level 20: it's enough to kill almost anyone instantly. A global Heroic that has a tiny cooldown, low mana cost and huge damage is a no-brainer. Shadow Fissure might take some practice to land reliably, but once you secure a well placed Frost Nova, it becomes invaluable. Best of all, the low cooldown ensures that in protracted team fights you can use it multiple times to soften up the enemy team. Oh, and it proves incredibly useful on Objective based Battlegrounds that require interaction (such as Towers of Doom). Chains of Ice allows Kel'Thuzad to slow players by 60% once the impact stun has ended. While the duration is brief (1 second), the slow is so drastic that players caught in your stun, especially against Glacial Spike, gaurentees you can land Frost Nova immediately against them. Power of Icecrown increases Kel'Thuzad's Spell Power by by 6% every time he stuns, roots or slows an enemy Hero. Considering Chilling Touch has an 8 second cooldown, and Power of Icecrown lasts 10 seconds, as long as you land your basic attacks you can maintain this buff permanently in a team fight. If you can also land your abilities, it's a free 30 Spell Power, bringing your total to 105 if you include your completed Trait. At this point, Kel'Thuzad's damage gets ridiculous. Variable: Hungering Cold adds a unique vulnerability to any enemies hit by the center of Frost Nova. If you can hit a player (or players) with multiple abilities, especially Death and Decay (this triggers the damage multiplier) the target will suffer over 800 additional damage at level 20 with 30 Blight stacks. Improving on a Heroic that's already fantastic, Might of the Scourge resets the cooldown of Shadow Fissure every time you hit a Hero with it. To state that this level 20 Talent is powerful would be an understatement. Several times I've landed back-to-back Shadow Fissure's more than four times, allowing me to snowball against the enemy team. In most instances, this bombardment of AOE damage becomes relentless and as the enemy team panic, they make mistakes and hit your Shadow Fissure's even more. These Hero Threat Levels (1 being lowest threat and 10 being highest threat) are to help you determine which enemy Heroes can give you a headache. For the Heroes listed here, take extra care as they're particularly dangerous for Kel'Thuzad. Anub'arak: Once he dives on you, you're done for unless you have a team that's babysitting you. This list of tips and tricks are just a handful of things we think will help your Kel'Thuzad play. We'll continue to add to the list as required and if you have any tips you'd like to share, let us know in the comments below and we'll place them here. 1. It's imperative that you complete your Trait as quickly as possible. Join in all team fights and use Chain's of Kel'Thuzad to hit two targets for a double-dose of Blight gain. 2. Your Trait has two completion stages, reaching the first at 15 Blight lowers your cooldowns by 2 seconds allowing you to complete the second much easier. 3. Death and Decay will cause no effect if it fails to hit a target. You cannot afford to miss. 4. Ideally, try to land Death and Decay on an Objective or in a close-quarter environment so that upon impact, the AOE zones players out. 5. Take acount for Death and Decay's delayed cast time. You need to aim carefully and predict where the enemy will be. 6. Death and Decay is great for softening up a minion wave. Hit them from the side, not the front, for maximum effect. 7. Frost Nova has a brief delay before it explodes. Try to always ensure your primary target is in the center so that they're rooted. 8. Try to stagger your abilities to take account of Frost Nova's brief delay. You want to be hitting your opponent with Death and Decay and Shadow Fissure once they're slowed or rooted. 9. Frost Nova is a good zoning tool even if you cast it without the intention of hitting someone. 10. If you can land Frost Nova against multiple Heroes it can prove a quick method of increasing your Blight. 11. With practice, you can land Chains of Kel'Thuzad > Frost Nova against a pair of Heroes for an instant stun and root combo. 12. Always try to land Frost Nova and Shadow Fissure together. If you cast them both back to back, they'll deal massive damage to anyone rooted. 13. Chains of Kel'Thuzad only attaches itself to enemy scenary, or enemy Heroes. There's little value in using it in lane. 14. You've 4 seconds to reactive Chain's of Kel'Thuzad so don't feel under pressure to instantly recast it. 15. Chain's of Kel'Thuzad is ideally used against a front-line to pull them back away from your team, or to stun a high value target. Even if you can't grab the Hero you want, just aim for the nearest to trigger the effect. 16. Always position yourself on the edge of a team fight. You have no escapes, and your abilities have too lengthier delay to protect you.